The report, “Children and parents: Media use and attitudes report 2018” (and its Annex) and “Life on the small screen: What children are watching and why” were made by Ofcom with analysis of 2,000 British children aged 3-15 years and their parents. Less than half of the parents of 3-4-years agreed that the internet is doing more good than bad. When prompted with the major concerns parents have about their children’s online life, “companies collecting information about what their child is doing online” came the top with 50% of parents expressing concern. Three other issues have increased in their level of concern from the similar research a year ago: the child damaging their reputation (42% vs. 37%), the pressure on the child to spend money online (41% vs. 35%), and the possibility of the child being radicalised online (29% vs. 25%). 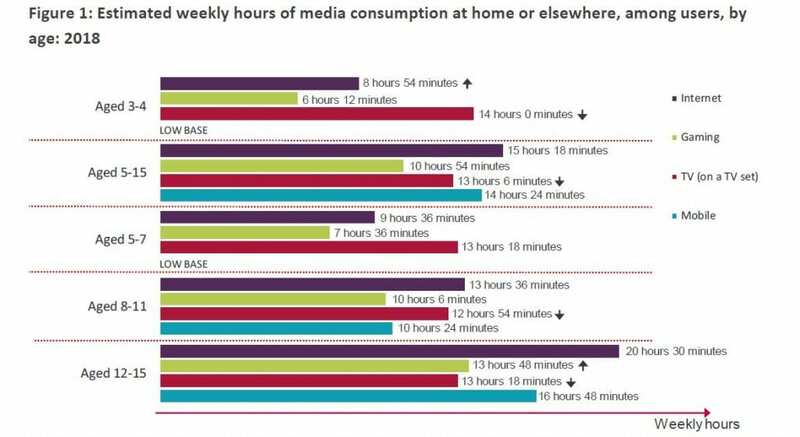 Published by Ofcom today, the reports showed that on average, a 5-15-year old child would spend more than four hours a day in front screens, including 2 hours 11 minutes online (same as a year ago) and 1 hour 52 minutes watching TV on the TV sets (8 minutes shorter than 2017). There are differences in media consumption patterns between age-groups and between social groups. For example, the older the age group, the more time the children would spend online, from less than nine hours per week for the 3-4-year olds to 20.5 hours for the 12-15-year olds. Or, children of the 3-4-year old group in C2DE households spend more time going online, playing games and watching TV on a TV set, compared to those in ABC1 households. When it comes to device ownership and the devices used for media consumption, the research found that 1% of 3-4-year olds already have their own smartphones, and 19% have their own tablets. The penetration rates go up to 83% and 50% respectively in the 12-15-year old group. Again, there are differences between sub-groups on the devices used to consume media on their devices. While TV sets are still being used by more than 90% of children across all the sub-groups, the percentage of them also watching TV on other devices increased from 30% in the 3-4-year olds to 62% in the 12-15-year group. The penetration of streaming services including Netflix, Now TV, and Amazon Video is already fairly high among all the sub-groups, with 32% of 3-4-year olds using at least one of them, going up to 58% in the 12-15-year olds. But YouTube is still leading in popularity. 45% of 3-4-year olds have watched YouTube, the penetration would go up to 89% in the 12-15-year olds. As well as content consumption, content creation is also on the rise among children, with “making a video” one of the most popular online activities. 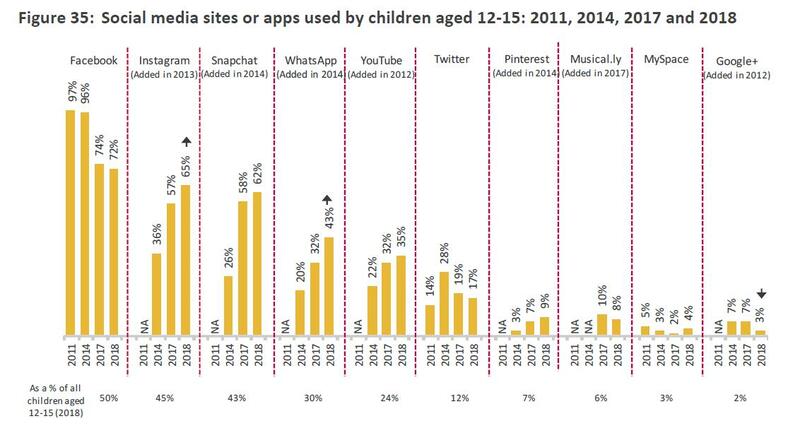 While on average 40% of 5-15-years have made an online video, nearly half of all 12-15-year olds have done so. Time spent on online gaming has remained largely unchanged from a year ago, ranging from a little over 6 hours per week in the 3-4-year group to nearly 14 hours in the 12-15-year group. But gaming is the online activity that demonstrates the biggest gender disparity. While boys in all age groups spent more time on gaming than girls, the difference went up to over 7 hours in the 12-15-year olds. On average girls in this group spent 9 hours 18 minutes playing online games while boys of this age spent 16 hours 42 minutes. Social networks are another important type of media consumption by children. Facebook remained to be the most popular social media among the 12-15 years group, but its downward trend has continued to the lowest level of 72% penetration since the high of 97% in 2011. Gaining popularity are Instagram (65%, up from 57% in 2017), Snapchat (62%, up from 58%), and WhatsApp (43%, up from 32%). More significantly, when asked to name their “main site or app”, equal number of 12-15-year olds (31%) named Facebook and Snapchat. Astoundingly, 1% of 3-4-year olds, 4% of 5-7-year olds, and 18% of 8-11-year olds already have social network accounts, despite that most social networks set their minimum age at 13. WhatsApp raised its minimum age for EU users to 16 prior to GDPR came into effect. 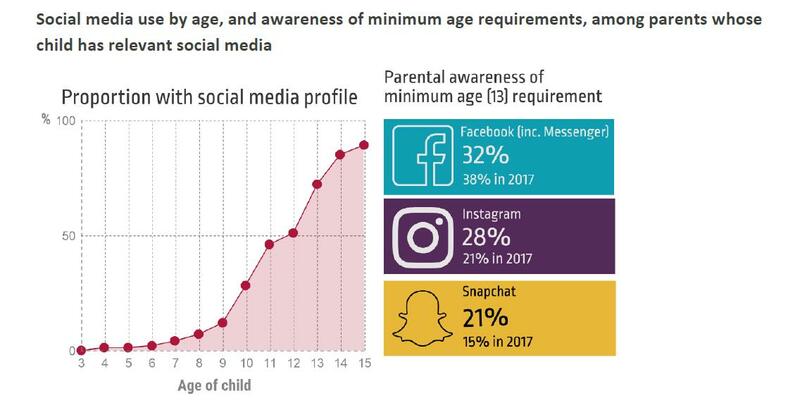 At the same time, less than a third of parents were aware of Facebook’s age limit, with even less awareness for the age restrictions of Instagram and Snapchat.